Raise your hand if you love writing proposals. No hands? That’s not at all surprising. Most people hate writing proposals. We find them a time consuming, mind-numbing, brain draining, frustrating chore. Yet buyers love receiving proposals, and this method of pitching for business is not going to go away anytime soon. Maybe shopping isn’t your favourite thing. But looking at your closet, things are pretty dire. You really need to buy something new to wear. You could go to a crowded shopping centre and fight it out with dozen of other people for a car park. Then, you’d have to slog your way through dozens of stores in the hope that one of them might carry what you are looking for. It’s a drain on your time and patience. Or, you could stay home, and check out the online stores for options. You wouldn’t have to fight the crowds, but there's still a lot of stuff to sift through to try to find something you might want. This takes a huge amount of time. Or, here’s another option – you could book a session with a personal shopper. You’d tell them what you want, they would sit you down in a dressing room with a glass of champagne and bring you outfit after outfit to try on. This isn’t a drain on your time or your patience. In fact, it's almost like going to a day spa. 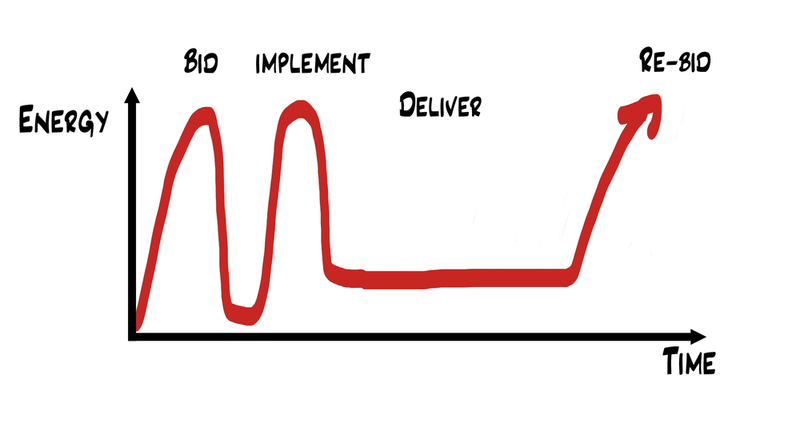 This is exactly the experience that buyers get when they put out a brief or tender and invite a response. They get a whole bunch of people bending over backwards to craft a proposal that fits their taste and needs. They don't have to go out and foot-slog around the market. They don't have to listen to 20 people pitch in person. They don't even have to talk to you if they don't want to. Why would they do all that work, when they can get you to do it for them for free? If you think that proposals are an imperfect way to pitch what you do, you would be right. But they are not going anywhere, because they simply make the buyer's life very easy. It all comes back to the distribution of labour. Under the old system of buying, where buyers had to take the time to build a relationship before they did business with you, most of the effort was theirs. Under the current system, the position is reversed. So proposals are never, ever, going away. Even if you hate doing them, you still need to find a way to make them work for you. If this is a problem you need to solve in your business, talk to me - I can help. If you want to win, you must be dominant, all-powerful and able to effortlessly crush your opponent, right? Well, not always. It turns out that there's a very special place in our hearts for winners who don't have those qualities, and who struggle valiantly against the odds. "The dam is broken.....the 62-year drought is over….". So declared the television commentator two minutes before the siren sounded on the 2016 Grand Final last Saturday, when the Western Bulldogs kicked the final goal that gave them an unbeatable lead over match favourites, the Sydney Swans. Dogs by name, and underdogs by nature, the Western Bulldogs hadn't won a premiership since 1954. They had already pulled of a coup just by making it to the Grand Final. Though widely considered unlikely to win, the Bulldogs fought their way to a 22-point victory. With it came the cheers and tears of thousands of people – including many, like me, who aren't even football fans. Why were we so affected by their win? Some of the most famous movies of all time tell the real-life stories of underdogs who triumphed over adversity, including Rocky (inspired by the story of Chuck Wepner), 8 Mile, Erin Brockovich and my personal favourite, Eddie the Eagle. We see our own hopes and dreams reflected in their epic struggles. Seeing others at a disadvantage also tends to ignite our sense of fairness and justice. This means that supporting the underdog is one way that we can confront and reduce inequality. In fact, even suggesting that a team or person is the underdog makes us more likely to support them. In study published in Personality and Social Psychology Bulletin, researchers asked 71 participants to imagine that two teams — one ranked higher than the other — were going to compete in an Olympic swimming event. In all scenarios, the participants said they would prefer to see the lower-ranked team prevail over the higher-ranked one, even if that higher-ranked team had been the underdog in a previous scenario. We also relate better to underdogs, seeing them as more “real”, or more authentic. In another study, psychology professor Joseph Vandello from the University of Florida asked students to watch a basketball game in which they were told that one team was the favorite. After watching the footage, the viewers characterised the underdog team as having less “intelligence” and “talent,” but more “hustle” and “heart”. Again, this pattern was consistent even when the scenario was flipped so that the other team was framed as the underdog. The viewers simply liked the people who were losing more than they liked the winners. If you’re already the underdogs, take heart. In his book David and Goliath: Underdogs, Misfits and the Art of Battling Giants, Malcolm Gladwell says that bigger is only better up to a point. Gladwell identifies 7 characteristics of the "winning little guy", including an honourable reputation; doing everything in in person; determination; empathy; teamwork; and being both passionate and likeable. To me, this also provides an excellent summary of the qualities of every winning bid team I have ever worked with, no matter how large or small. But if you’re not the underdogs, take this as a warning. If your team already feels like they are the sure-fire winners, and they are in any way arrogant or entitled about this, you may have a problem on your hands. Just like a Grand Final, one thing is for sure in a competitive pitch - it isn't over until it's over. The culture you want for your pitch team is one where the prevailing conversation is about what we can do for the customer, not what's in it for us. So how can you get your team to think and behave like underdogs, and harness the extra energy and empathy that comes along with it? Here are five values and behaviours to encourage. Ask more questions. Underdogs assume less, read the briefing thoroughly, and carefully flag any issues and concerns. Speak with humility. Underdogs don't assume they already know everything, and they treat the opportunity (and the customer) with respect. Work harder. Underdogs are in early, stay late, and put in the hard yards when they need to. They don’t leave the work to someone else. Work as a team. Underdogs don't blame each other when things get difficult, and adversity will bring them even closer together, rather than pulling them apart. Express thanks and gratitude. Underdogs are excited just to be on the journey, and aren't solely focused on the destination or the win. Is it time to pimp your proposals? For most people in business, proposals are not a joy – they’re simply a hassle. Proposals chew up a lot of your time and resources. You spend hours, days or weeks slaving away over them, and when you lose, there are no prizes for second place. Customers don’t give you useful feedback (or any feedback) and it can be impossible to work out what you’re doing wrong. Imagine your most recent proposal has just been graded, and is sitting in a stack, on a desk, inside your buyer’s office. On the bottom at level 1 are the proposals that are the most unappealing. If yours is in this part of the pile, we need to do some work on your message – what you are actually selling. Above this at level 2 are the proposals the buyer found unclear; they didn’t quite “get it”. Here, we need to work on your presentation. Above the line are the level 3 proposals the buyer sees as competent. On the surface, these seem okay, but they often lack evidence to support the claims you’re making. Without this, you won’t be winning business as often as you should be. Where you want to be is at levels 4 and 5. Level 4 proposals are convincing, and show a level of strategy and insight that others don’t. At level 5, you’ve really made it; your proposals are so compelling that buyers simply can’t say no to you. At this level, you’ll be able to leverage more business, at better margins, because you are positioned as the go-to people in your market space. Compelling and convincing proposals are a combination of style, substance and relevance. Problems happen when any one of these elements is missing; the “proposal” becomes a brochure, a report, or a presentation, none of which is likely to get you hired. A proposal effort that isn’t getting you results can leave you feeling stuck and frustrated – like being trapped in the movie Groundhog Day. But no matter where you’re starting out, there is always a way to improve. When you're the incumbent supplier seeking to retain a customer or contract, big-noting yourself is almost impossible. The customer has experienced how you work, heard about everything you’ve already done (good and bad) and seen you warts and all. Good performance is just an expectation; it’s what you are being paid for. The customer isn’t going to give you a gold star for meeting your KPIs. That’s why relying on your track record when it comes to competing for business you already have is never a successful strategy for incumbents. Culturally, at least here in Australia, our aversion to other people big-noting their achievements begins early. This year, my son started Year Four, and he and his friends have been learning all about leadership. This culminated in each of the kids campaigning for a junior school leadership position, like Sports Leader, Arts Leader, Environment Leader, Social Responsibility Leader or membership of Student Representative Council. What’s in it for me? Every buyer (or voter) asks this question, whether they already know and work with us, or not. When you're pitching again for business you already have, resist the urge to talk only about what you’ve already done, or risk sounding like a know-it-all that no one wants to vote for. Spend at least half of your time outlining your plan to build the customer’s future; this immediately switches the focus from pitching to helping, and you’ll find it comes as a relief both to you and to your audience. In the past few weeks, we’ve been talking about our own internal barriers to business development (as opposed to the barriers that customers and the market throw at us). Practical barriers are the things we think we "need" in order to get out there and talk to people about what we offer (product information, marketing collateral, competitor research). Structural barriers are the systems that we create – for what seem like sensible reasons at the time – and that actually end up holding us back. Psychological barriers, however, come from several places; lack of confidence, too many comparisons to others, and the experience of loss and rejection. Let’s look at confidence first. Confidence can be a barrier, because in other people’s eyes, confidence equates to competence. This, in turn, has a huge effect on our ability to turn opportunities into sales. In The Confidence Gap, Katty Kay and Claire Shipman point to a growing body of evidence that shows just how devastating a lack of confidence can be. Success, they found, correlates just as closely with confidence as it does with competence. While Kay and Shipman’s research related specifically to confidence issues affecting women, lack of confidence is a problem for anyone working in a profession where public performance and scrutiny are a regular part of the job – like business development and sales. To overcome a lack of confidence, we might try to “fake it until we make it.” Unfortunately, this doesn’t work too well. According to Cameron Anderson, a psychologist at UCLA (Berkeley), extremely confident people genuinely believe they are good, and it’s this self-belief that is attractive to others. “Fake confidence just doesn’t work in the same way,” he says. No matter how much bravado we muster, Anderson explains, others will pick up on our shifting eyes, rising voice and other giveaways. In 2009, Anderson undertook a study to find out why confidence leads to a perception of competence. He gave a group of 242 students a list of historical names and events - including some that sounded plausible, but were actually completely made up - and asked them to tick off the ones they knew. Some students ticked off the fakes as well as the real events, implying that they thought they knew more than they actually did. Afterwards, Anderson also asked the students to rate one another according to their social standing within the group. The students who had picked the most fakes also achieved the best ratings – in other words, those who had the strongest confidence in their abilities also had the highest social standing. Real confidence only really comes from self-belief: from understanding our true value. When you have done the work to establish the worth of what you’re doing and saying, it’s much harder to shake your confidence. Get out there and get on with it! When it comes to new business development, there are a number of barriers that we will all face from time to time. These can be internal barriers –the barriers that we make ourselves, or that come from within us – or external barriers, which come from outside of ourselves, including the barriers put up for us by customers and competitors. One of the internal barriers is what I call “practical barriers”. This includes lack of access to product information, marketing collateral, competitor research, or any one of a number of other things that we think we "need" in order to get out there and talk to people about what we do and offer. It can be hard to argue with practical barriers. After all, a thing either exists or it doesn’t. However, when our reluctance to “do” business development is primarily about our lack of brochures, slide decks, white papers, and those sorts of things, what this really means is that we’re not yet sold on what we are supposed to be selling. The first sale is always to yourself. If you aren’t sold, no one else will be. In their book Conviction, Peter Cook, Matt Church and Michael Henderson explain that it is more likely to be the person who is doing the selling who has objections – ‘too pricey, don’t need it, not now’ – instead of the customer. In place of “objections”, they say, what customers really have is questions, considerations, alternative options and time. These are all things that we need to manage when educating ourselves about what are selling, and all of it comes before we try to educate a customer. According to a study conducted by B2B research and advisory firm Sirius Decisions, up to 70% of content and collateral created marketing departments in business-to-business organisations sits unused anyway. Practical barriers aren’t really barriers – they are more like “objections” we have to the idea of getting out there and talking to people about what we do. Worry less about how good your PowerPoint slides are and think more about the value in what you’re selling. The most successful suppliers fall quickly into a pattern of continual improvement as soon as they win a contract or customer. Unfortunately, others – who are really just doing no more than keeping up with the basic requirements – are probably setting themselves up to lose. When it comes to important contracts and customers, the procurement process is the “unbalanced force” – something outside ourselves that propels suppliers into a kind of recurrent stop-start motion. Bid, deliver, and then bid again. But that doesn’t make this a pattern for suppliers to aspire to. For incumbent suppliers, what happens in the delivery phase – which is usually the longest and most significant in the relationship – is what sets the stage for winning again. What customers usually see from a supplier is this. There’s the initial flurry of excitement when competing for the business, followed (usually) by a short lull while the customer makes up their mind. When we win, it’s a steep climb to get everything set up right, and then we settle back into a comfortable level of delivery until we need to compete again. Choosing the path of continual improvement is what really helps to sustain a customer relationship over the long term. That’s because not everything is within our control. We can’t control how customers choose to buy, and we can’t control what competitors do either. But we CAN choose our own state of mind. We do get to decide how much of our energy, enthusiasm and ideas – in short, how much of ourselves - we’re prepared to commit to making sure our work gets better and better. Imagine how much productivity is lost in businesses, and how many problems remain unsolved, just because buyers don’t have the balls to make a decision and sellers don’t push a solution when they actually have one. Ever poured your heart and soul into a huge tender or proposal that went nowhere? Unfortunately, this is not uncommon. And it’s not just sellers whose time is wasted: it’s buyers’ too. A loss to “no decision” wastes everyone’s time and energy. Indecision and waste are everywhere in complex sales. And not just in business. Take real estate for example. Escape to the Country is a British reality-TV show that helps hassled Londoners to buy property in the picturesque English countryside. It’s highly aspirational, but not very practical, as very little property actually changes hands on the show. Most of the time it’s a lovely tour through some beautiful homes accompanied by tinkly music and a soothing voiceover. While I like a good property stickybeak as much as the next person, I find Escape to the Country frustrating, as so few people actually BUY the gorgeous homes they look at. Instead, they wander off “still searching for their dream home”, while the poor home owners trying to sell the place are left polishing the andirons in their inglenook fireplaces. Why don’t these property buyers, seemingly so keen to escape to the country, actually buy? I reckon it’s because many come on the show with a massive laundry list of likes and dislikes. They are shown three homes, and the first two tick all their boxes. Ironically, it’s often the third house - the “mystery house” - that gets the best reception, as it challenges the buyers’ preconceptions and gives them something different (and better) than what they asked for. Business buyers are exactly the same. They think they know what they want, but they don’t REALLY know until they see it. So don’t just tick the boxes. Use your expertise, and offer them something that will surprise and delight them. That’s how you will emerge as the clear winner. A bid team is a living organism – a group of smart people who come together to apply their skills and knowledge to developing a functional solution that will win or retain an important contract or customer. The most successful teams share a particular type of DNA. In very simple terms, DNA is a blueprint for how to build a living organism: it gives instructions to our cells about how they should grow and function. Likewise, bid teams need the right mix of customer and technical experts, balanced by a Bid Leader with the authority to make commercial decisions, and the skills to draw out the best ideas and drive the organisational change necessary to win. What often happens, though, is that it’s left up to the customer experts – the sales team – to run bids on their own. Customers have expectations and the sales team knows all about them: they will happily tell you what they are. Without the leadership and authority to implement these expectations, or the technical know-how to configure the systems and processes of the organisation to suit the customer, this knowledge remains under-used. Building your team with the right mix of people creates a meeting of minds that will help you win. As you can start to see from this diagram, it’s at the intersection of these specialities that the magic truly happens. Customer experts provide information about customer expectations, which the commercial experts use to provide leadership to the technical people, who can configure a solution for the customer. Avoid letting senior leaders outside your team hijack the bid strategy, particularly if they don’t know the customer well or haven’t worked at the coalface for a long time. Often these people dominate the discussion with commercial concerns and big-picture competitive strategy, at the expense of valuable customer and technical insights, and can make disastrous decisions that undermine the good work of the people who really know what is going on. Dreamworks’ new animation feature Home stars Jim Parsons from Big Bang Theory as Oh, an accident-prone alien who believes “Oh” must be his name, as it’s what his fellow Boov say every time he enters the room. The Boov are a tribe of intergalactic scaredy-cats who turn yellow when they’re afraid (often) and are experts in running away from their problems. After invading Earth and relocating all the humans to Australia – the most remote place the Hollywood scriptwriters could probably think of – their leader, Captain Smek (Steve Martin) is stumped as to what to do next. Smek is a textbook example of every bad boss you’ve ever had. Bereft of ideas himself, he straps his fellow Boov to machines and orders them to come up with some. The ideas he likes, he takes as his own. Those he doesn't like, earn the thinker a clunk on the head with his prize possession, a scepter called the “shusher”, which Smek stole from the Boov's greatest enemies the Gorg (the scary-looking dudes the Boov are running away from, and also the reason why they’re chasing him). Steve Martin plays Captain Smek for laughs, but we can empathise with him. Smek has a lot on his plate, and we all grab for the “shusher” when we are under pressure. For a leader responsible for a big project like a major bid or pursuit, the pressure to win or retain millions of dollars worth of revenue and hundreds of jobs is daunting, unrelenting and sometimes toxic. Under this kind of stress, we sometimes shut down a team member who has something important to say. We might inadvertently hijack an idea that actually came from someone else. It’s easy to rush in with our own ideas at the expense of someone else’s. None of us can control what customers decide to buy. We can’t control what competitors do. It’s hard to let go of the little control we DO have over a competitive process. But trying to do it all ourselves can cost us – big time. In an important bid, the energy and enthusiasm of your team is your most precious asset. Preserve it by engaging an external facilitator to help you develop your bid strategy. You’ll get to contribute your valuable knowledge, support your team’s energy, nurture their great ideas, and have a sounding board to develop your own. And you get to retire the shusher. For the last few weeks we’ve been looking at what NOT to do if you want to avoid losing a competitive tender. One thing all these behaviours have in common is that they are keeping you inwardly focused – on yourself and your firm. To leapfrog the line between winning and losing, start to turn your attention outwards, to the customer and the opportunity. 1. Compliance with threshold requirements. If you need quality accreditations such as ISO9001 or ISO4801 and don’t have them, it’s rare to win against competitors that do. Non-compliance is an easy reason for a buyer to exclude your bid. 2. Compliance with any mandatory requirements. In the Request for Tender document, look for the words “must” to indicate what’s mandatory. 3. Compliance with the specifications or scope of works. Can you do everything that the buyer is asking for? That’s important. As the expert, you may have ideas about how things could be done better (I’d certainly hope so, if you want to win). But always submit a complying bid, even if you think your alternative offer is stronger. By the time they have reached a competitive tender, some buyers have already made up their mind. 4. Contract compliance. This is one area where buyers definitely prefer no changes. Some will even go so far as to specify that you can’t vary the contract terms. 5. Finally, make sure your tender responses (written answers) are compliant. Analyse the questions properly to make sure that you’re answering every part, and understand why the buyer is asking each question. Include enough qualitative and quantitative evidence to give you a high evaluation score. While the first four are usually OK, the last can be a challenge without advice and guidance. If you need a leg up and over the final hurdle, my Master Class Program will get your team compliant and see you landing on the "yes" list more often.